How to watch The Guernsey Literary and Potato Peel Pie Society (2018) on Netflix Netherlands! Sorry, The Guernsey Literary and Potato Peel Pie Society is not available on Dutch Netflix, but you can unlock it right now in the Netherlands and start watching! 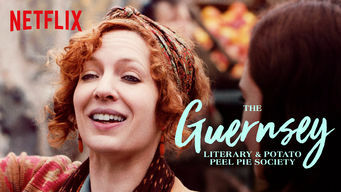 With a few simple steps you can change your Netflix region to a country like Pakistan and start watching Pakistani Netflix, which includes The Guernsey Literary and Potato Peel Pie Society. We'll keep checking Netflix Netherlands for The Guernsey Literary and Potato Peel Pie Society, and this page will be updated with any changes. The Guernsey Literary and Potato Peel Pie Society is not available in Netherlands BUT it can be unlocked and viewed! A London writer bonds with the colorful residents of Guernsey as she learns about the book club they formed during the WWII German occupation. They bravely defied the Nazis -- with books. Now a spirited writer takes a life-changing journey as she tells their tale. There is a way to watch The Guernsey Literary and Potato Peel Pie Society in the Netherlands, even though it isn't currently available on Netflix locally. What you need is a system that lets you change your Netflix country. With a few simple steps you can be watching The Guernsey Literary and Potato Peel Pie Society and thousands of other titles! Watch "The Guernsey Literary and Potato Peel Pie Society"